the inauguration of the centre. 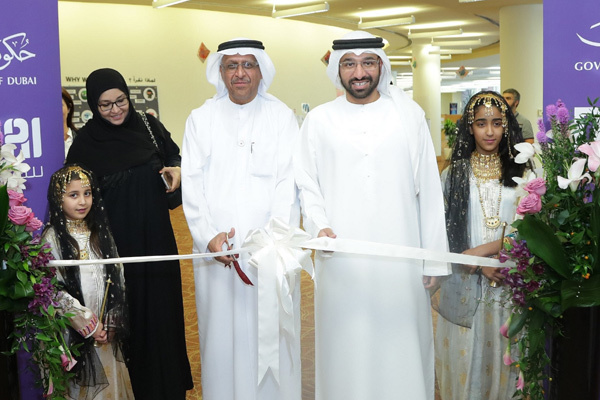 Dubai Culture & Arts Authority (Dubai Culture), the emirate’s dedicated entity for culture, arts, heritage, and literature, inaugurated a heritage development centre in collaboration with Zayed University, Dubai. The agreement was signed between both parties by Saeed Al Nabouda, acting director general of Dubai Culture, and Dr Reyadh Al Mehaideb, vice president of Zayed University. The new centre which was inaugurated at the university is the first heritage development centre in a higher education institute in the UAE and the 6th centre for Dubai Heritage Development Centres, which was launched through an initiative between Dubai Culture and Dubai Education Zone in 2011. Five public schools in Dubai were established to serve as educational platforms for UAE's heritage and to embody the lives of grandparents. Dr Al Mehaideb welcomed Dubai Culture’s initiative to establish a heritage development centre, in cooperation with the university at its campus in Dubai. He said that this step is in line with the university’s efforts to strengthen the students’ association with the values of the UAE society established by our fathers and grandparents across generations, and to motivate them to adopt these values in their modern ideas and practices. Al Mehaideb stressed that these students, who are in the university that proudly holds the name of the Founding Father, are launching creative initiatives, such as writing the book ‘Story Mile 2014’ that was published years ago, writings and drawings by students from Al Kharareef Storytelling Club that inspire from old tales to create new stories for today’s generation, and the book ‘UAE’s Pre-Unity Era’ which was written last year by students from the College of Communication and Media Sciences (CCMS). The university also organised the ‘Lest We Forget: Emirati Vernacular Photography’ exhibition, held by the students of the College of Arts and Creative Enterprises five years ago, gaining recognition for it inside and outside the country.